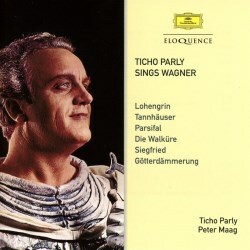 Ticho Parly may be largely forgotten today but in the 1960s he had a rather important international career, primarily as a Wagnerian Helden tenor. He appeared at both Bayreuth and the Metropolitan, debuting at the Met as Tristan opposite Birgit Nilsson’s Isolde, two big-voiced Scandinavians. Parly was Danish, and like his great compatriot Lauritz Melchior he started as a baritone. He sang in several productions at the Stockholm opera in the 60s and I heard him on the radio as Otello, which inspired me to buy his Wagner LP issued at about that time. He didn’t quite live up to my expectations but I listened quite frequently to the record and learned to like these arias, though Wagner was not then my bread and butter. Parly in his later years settled in Seattle where he died in 1993 at the age of 64. His recording career was short. The Wagner programme on the present disc, issued in 1966, remained his only contribution to the record market. The two bonus tracks, from Fidelio and Der Freischütz, were recorded at the same time and probably intended for a second LP which never came into being. This is the first time they have been issued and the Wagner programme has never been available on CD until now. The cover picture was also on the LP cover and shows a blond Viking who was cut out to be a Wagner hero. Coming back to these recordings after so many years I hear him very much as I heard him then: a big, powerful voice with a tone that is rather rough-hewn and with a vibrato that at forte tends to spread. But there is conviction in what he sings and he has the ability to scale down his voice and find softer nuances. His Lohengrin has a certain nobility and becomes a believable hero. He regarded his Tannhäuser as his best role and he sings the Rome narration with a lot of restraint but also with impressive dramatic power. His Parsifal has an inspired glow that is quite compelling. There follow a number of excerpts from Der Ring des Nibelungen. First we meet Siegmund in the first act of Die Walküre. The often heard spring song Winterstürme wichen dem Wonnemond lacks the youthful freshness of a James King or Stuart Skelton and the wide vibrato is disturbing, but his declamation is intense, and in Ein Schwert verhieß mir der Vater his cries of “Wälse” ring out with impressive power. The first two scenes from Siegfried are heroic, though the hammering in the forging scene is pale and un-atmospheric. The Waldweben is beautifully sung with restrained lyricism, and Siegfried’s death scene from Götterdämmerung is also sensitively performed. The very best singing comes actually in Florestan’s aria from Fidelio. It is a shame that this track has been hidden unpublished in the DG vaults for half a century. Here his tone is freer and his phrasing more sensitive, while there is no lack of intensity. Max’s aria from Der Freischütz is more ordinary, cruder in tone but still nice to have. The always reliable and inspirational Peter Maag does a good job with the orchestra of the German Opera in Berlin and the recording still sounds very good. While all these arias and excerpts can be heard in even better readings elsewhere it is still valuable to have these back in circulation. Eloquence are doing a great job sorting out forgotten grains of precious metals!